Written by Jonathan O'Donnell. Last updated August 2018. Some might argue that we’re living in the Age of Innovation. With technology and more open lines of communication affecting nearly every industry, consumers are often benefiting in terms of lower prices and better deals. Student loans are no exception. For example, CommonBond has taken the old business model of student lending and turned it on its head. With exciting new offerings, highly competitive rates, and a significant feel-good factor, CommonBond is an appealing lender for you to check out. 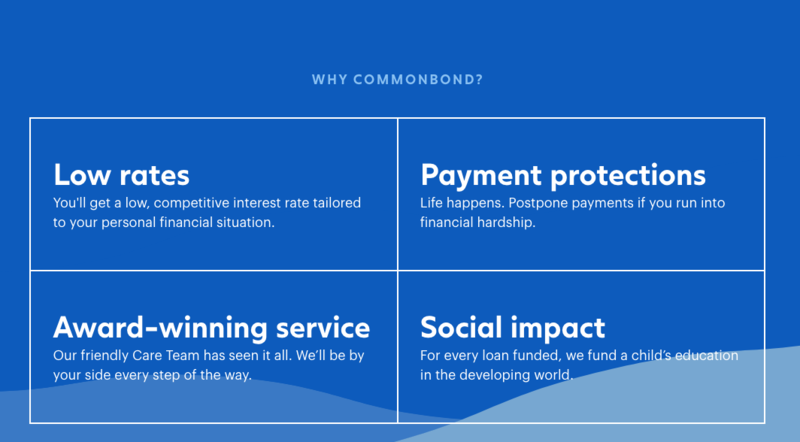 Why Get A Student Loan Through CommonBond? CommonBond entered the student loan marketplace five years ago with a novel idea: bring the concept of crowdsourcing to college loans. The idea quickly garnered attention from investors and CommonBond took off. CommonBond has an award-winning care team (which is pretty rare for the student loan industry!). They offer resources to the student and their families, such as an undergraduate student loan calculator which provides information about the different options you have to pay for school. What Are the Benefits of a CommonBond Private Student Loan? What’s the biggest benefit of a CommonBond loan? Savings! CommonBond prides itself on no double-digit loan rates. That means that even their highest-interest loans top out at under 10% interest rates. CommonBond is the first and only finance company with a one-for-one social mission. Remember that “feel good” factor we mentioned? Check this out: For every loan CommonBond funds, it also funds the education of a child in need through a partnership with Pencils of Promise. Each year, CommonBond sends a select group of members to Ghana to meet the students they're helping and make a direct impact on local communities. They also host the annual CommonBond Social Impact Award, which provides funding to young entrepreneurs with socially-minded business ideas. What Private Student Loans Does CommonBond offer? CommonBond offers undergraduate and graduate student loans in most states. The exceptions are South Dakota, Idaho, Mississippi, Louisiana, Nevada, and Vermont. You can apply for loans for as little as $3000. Maximum loan amounts are $200,000, or up to the cost of school attendance. What Are the Eligibility Requirements for CommonBond Private Students Loans? CommonBond doesn’t have any household income requirements for loans. Applicants must be citizens or permanent residents of the U.S., and students must be enrolled in school at least half-time in order to qualify. CommonBond issues loans for eligible Title IV schools (generally, those that participate with federal student aid programs) or not-for-profit schools. CommonBond does not issue loans for for-profit or two-year institutions. Applicants must apply with a qualified cosigner who has a credit score of 670 or higher. Borrowers with excellent credit are generally entitled to lower interest rates. Cosigners may be released after 24 consecutive on-time payments. What are the Rates and Fees for a CommonBond Private Student Loan? As we mentioned above, CommonBond offers extremely competitive interest rates, with variable interest rates from 3.72% - 9.68% APR and fixed interest rates of 5.30 - 9.82% APR for qualified undergraduate borrowers. Variable interest rates for graduate loans range from 3.72 - 9.63% APR. Fixed interest rates range from 5.30 - 9.79% APR (as of August 2018). CommonBond offers payment terms of 5, 10, or 15 years. Borrowers may select from immediate repayment, interest-only payments, or fixed monthly payments while in school, or they may opt for fully deferred payments. There is no application to apply for a student loan with CommonBond. There is, however, a 2% origination fee when the loan is issued. Does CommonBond Offer Discounts for Student Loans? CommonBond offers a 0.25% reduction in interest rates if you sign up for autopay. 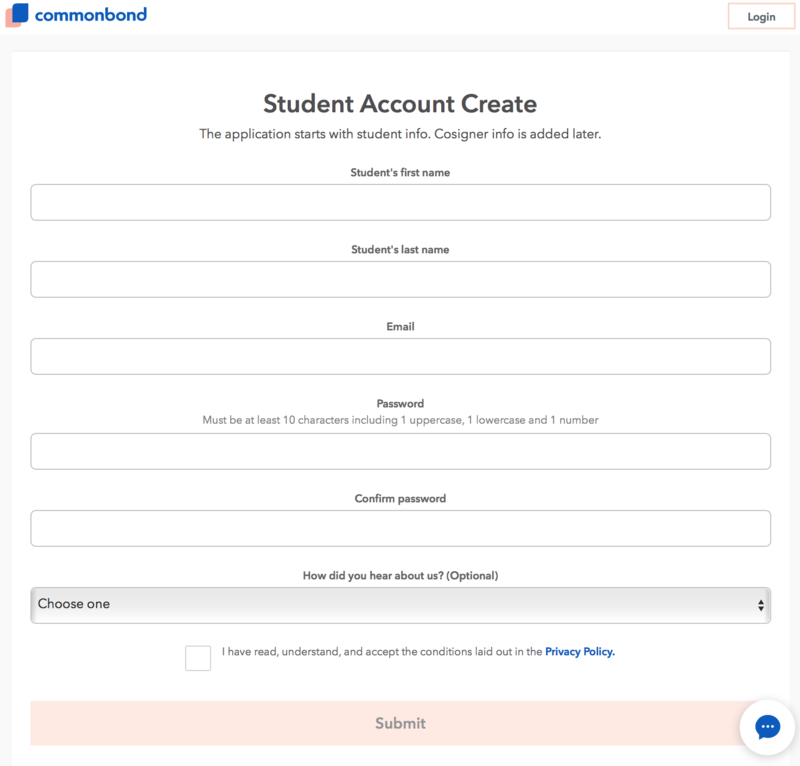 What Is the Application Process for a Student Loan from CommonBond? t takes just 15 minutes to apply. You’ll get a conditional approval within minutes, and a full approval or decline after your credit has been reviewed. Should You Apply for a Private Student Loan Through CommonBond? If you’re looking a private student loan, CommonBond is a solid option to consider. Enjoy attractive loan rates while helping others at the same time … it’s doesn’t get much better than that, does it? Learn more about private student loans from CommonBond. 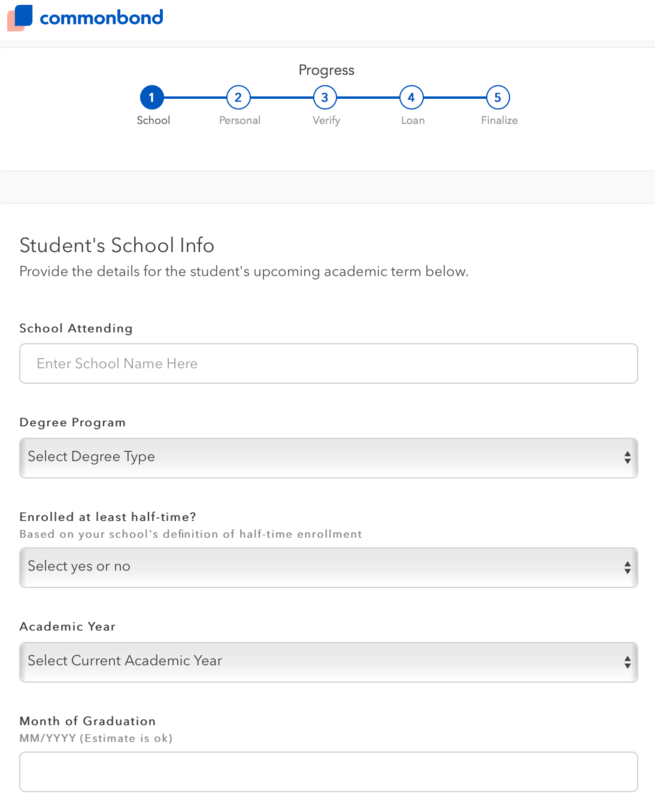 NitroCollege.com is a free website designed to help students and their families evaluate how to responsibly pay for their college education. Before recommending any services we put lenders thru a vetting process that includes: the competitiveness of rates, repayment options and terms, any discounts offered, any fees or penalties to be aware of, responsiveness to customers and applicants, and the lenders overall reputation and history. Nitro is not a lender and is not involved in the private student loan approval process, nor do we make credit related decisions. The lenders profiled on our site are the ones who will issue and approve your private student loan applications. We will sometimes earn a fee for recommending various products and services to you. Actual interest rates may vary depending on your credit score, income, savings, type of degree, and whether you apply with a cosigner. Here at Nitro we strive to provide the most up-to-date information, but you should always check with individual lenders for current rates, terms, and conditions before applying for private student loans.